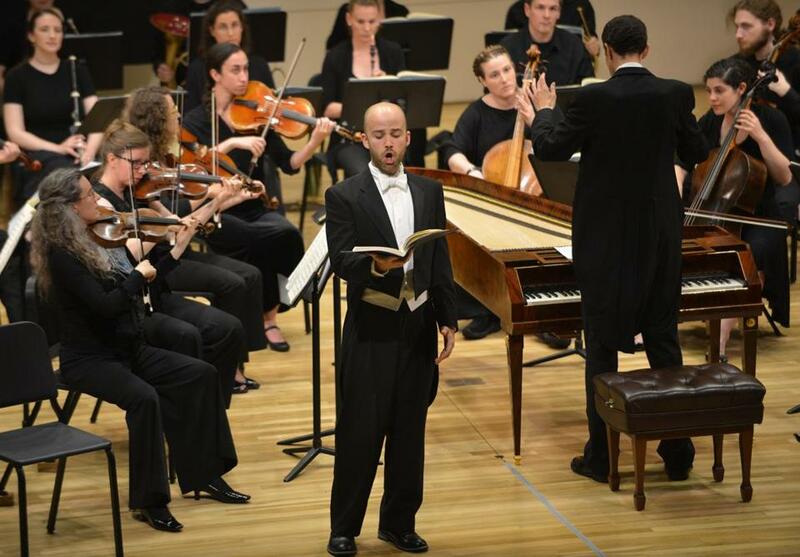 Tenor Zachary Wilder sings while Edward Elwyn Jones conducts during the Grand Harmonie performance at Harvard. CAMBRIDGE — Sure, being the king sounds good. But actually, it’s constant stress. You’ll be stuck in a palace, far from the joys of nature. You’ll be forced to give up your girlfriend and marry for political gain. And the hours? The hours are terrible. Aminta, the hero of Mozart’s “Il re pastore,” would rather remain a shepherd, with his Elisa, with the job’s “tranquil air and serene days.” But when Alexander the Great shows up and singles you out as the lost heir to the throne of Sidon, things get complicated. But not too complicated. “Il re pastore,” given a concert performance on Friday by the period-instrument group Grand Harmonie, is frictionless entertainment. Composed for a visit by the Archduke Maximilian of Austria, “Il re pastore” finds the 19-year-old Mozart in skillful command — if the melodies aren’t as memorable as Mozart’s best, they still flow with effortless fluency — but lavishing that skill on a stock libretto that keeps the dramatic thermostat consistently moderate. The piece eschews conflict for comfort, dramatic tension for musical and vocal display. Luckily, Grand Harmonie’s performance was the beneficiary of some very fine singing. Soprano Dominique Labelle brought her characteristic clarion polish to the part of Aminta; though her voice was not as fresh by opera’s end, her first-act showpiece, the feistily pastoral “Aer tranquillo,” was especially stylish. As Elisa, soprano Amanda Forsythe traveled from nimble coloratura to some seriously ringing power; one of the best recitative singers around, Forsythe made those stretches of exposition into a display of vocal extravagance all its own. Labelle and Forsythe formed a formidable pair, especially in their Act I duet “Vanne a regnar,” the two combining in precipitous passagework that made their proclamations of “innocente amor” incongruously ravishing. Tamiri, the deposed princess that Alexander decides to marry off to Aminta, was sung by soprano Teresa Wakim with the kind of effortless, simple clarity that, technique-wise, is anything but. As Tamiri’s lover, the nobleman Agenore, tenor Jonas Budris effectively drew on what dramatic stakes there were: tentative at the outset, as his character’s despair increased, so did his singing’s focus and posture. Zachary Wilder was a great Alexander, nonchalantly confident in voice and bearing, his bright tenor running through the character’s roulades with easygoing swagger. The orchestra was tight and energetic, with Grand Harmonie’s period winds — wooden flutes, valveless brass, tangy reeds — providing especially brisk colors. (Where modern horns might smooth out harmonies, the four natural horns injected ear-opening fizz and funk.) Directing from the fortepiano, conductor Edward Elwyn Jones garnished the overall brisk pace with enough lilt to keep the phrases airborne. Of course, everything works out well: lovers are reunited, Aminta gets to have his throne-shaped cake and eat it too, and (in appropriate flattery of the Archduke) Alexander’s leadership is duly hailed. (Nowadays we might look askance at Alexander’s wedding present to Tamiri and Agenore — a bit of military-backed nation-building — but it is, one supposes, the thought that counts.) If “Il re pastore” isn’t much more than a showpiece, the show is nevertheless royally agreeable.